So I supposed I’m a little spoiled when it comes to being published. 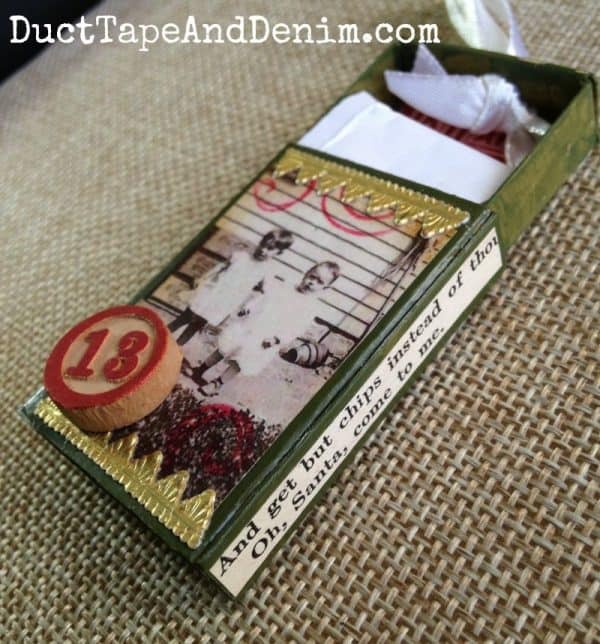 This matchbox Advent calendar is the first DIY craft project I ever sent in to a magazine. And it was also the first one ever published! Don’t be discouraged if you’re still trying to get published… I’ve had a LOT since then that were rejected. Just keep trying! This Advent calendar was made with 25 little matchboxes that I decorated and slipped the Advent reading for that day inside. See the paper with the Scripture reading for the day inside? I made these several years ago and didn’t take step by step photos so I’ll just explain how I made them. Paint half the boxes red and half green. They’ll need at least 2 coats. Let dry in between coats. Paint inside and out. Find bingo numbers to coincide with the days of Advent. I didn’t have bingo numbers for some of the days so I cut the squares out of the old bingo cards, too. Lay out boxes, alternating between red and green. For now, just lay the numbers on the boxes. Don’t glue them down yet. I love looking at these to see how the kids have changed so much over just a few years! 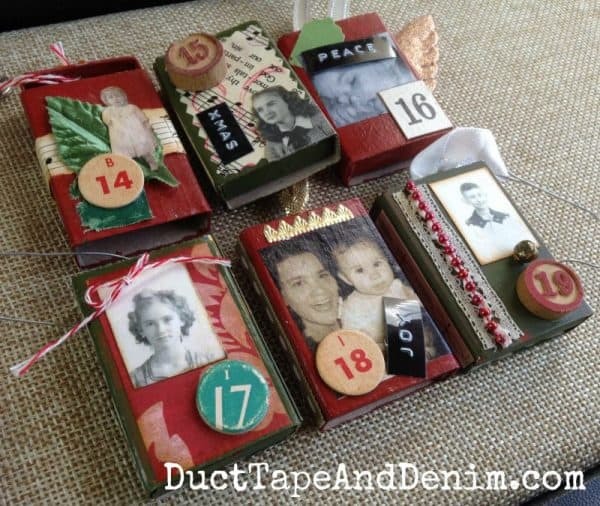 Cut rectangles of scrapbook papers, vintage wrapping papers, or music to fit inside the boxes. Choose your images. Digitally edit if needed (crop, or change to black and white or sepia tones). Size photos to fit the boxes and print. Collect all your paper scraps and trims. Tear some of the papers and use the patterned scissors for others. Play with these and the images until you’re happy with how they look. Stamp swirls on some of the papers and photos. Ink some of the edges. Glue everything down. I also covered the entire box with decoupage glue before adding the dimensional pieces. We’re admiring my first article in Somerset Holidays magazine! Punch a small hole in the top of each. Thread a ribbon, string, chenille stem, or ornament hook through each. Print Scripture verses, cut, roll up, and put one inside each box. 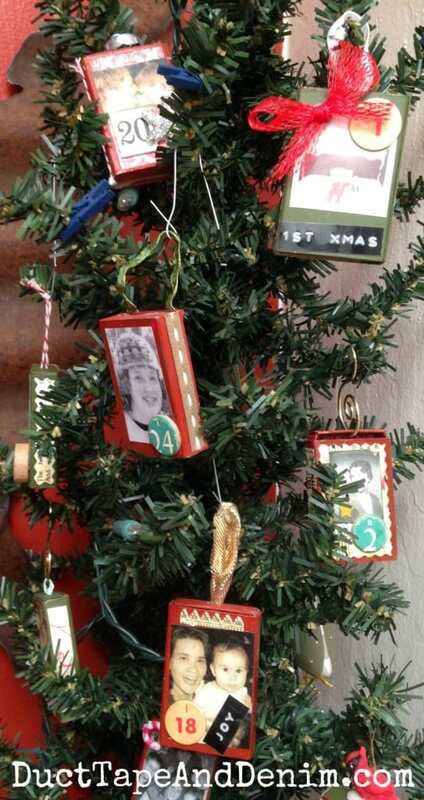 We displayed ours on an evergreen garland on our staircase. Beginning December 1 open one box each day and read the Scripture verse inside. Jordy’s hiding behind my article. Not Consumed has a printable Advent reading plan. 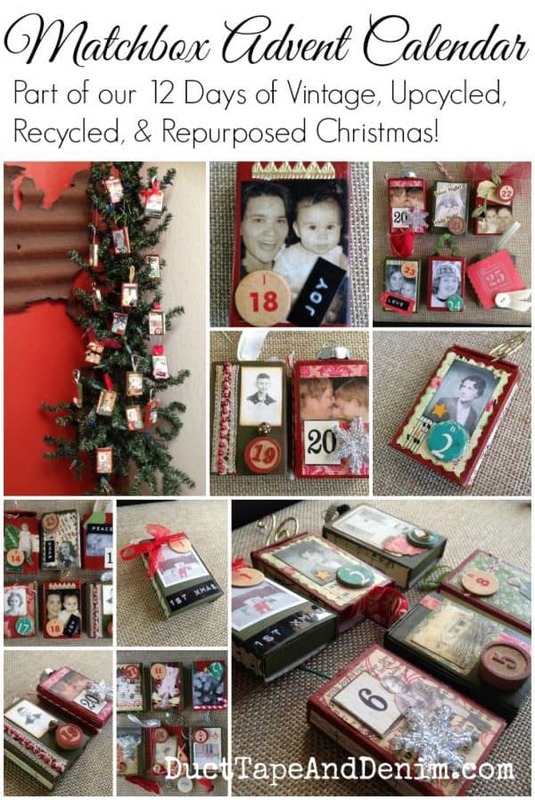 This is a part of our 12 Days of Vintage, Upcycled, Recycled, and Repurposed Christmas series. Click the photo below to sign up and get lots more Christmas ideas. 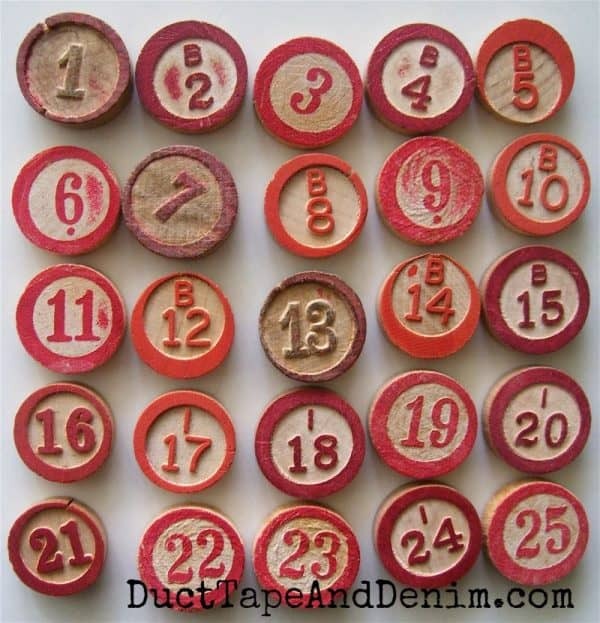 I love bingo cards and the wooden numbers. Wouldn’t these make a great Advent calendar? So, what did we do with all the matches? We stuffed them all in one large matchbox and didn’t have to buy matches for a LONG time! Leave a comment and let me know how you do your Advent calendar. 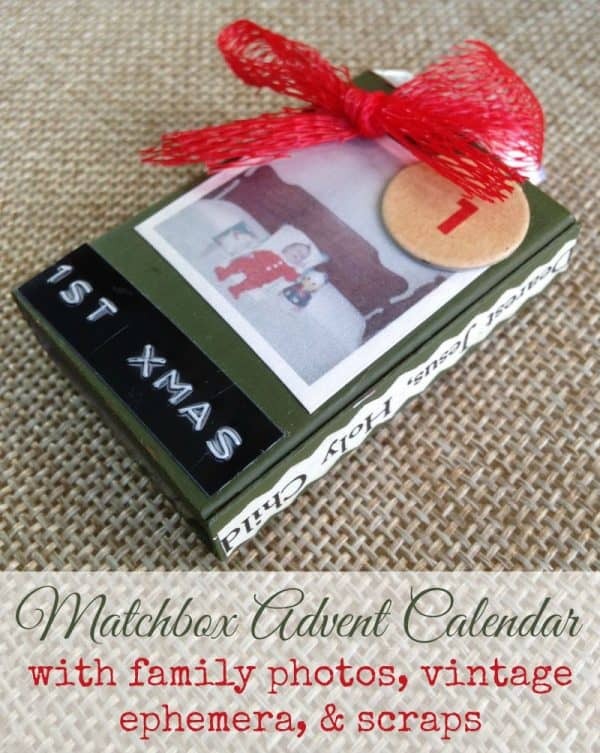 DIY Matchbox Advent Calendar was first published December 6, 2008. Matchbook Advents. How adorable is that!!!! So impressed with your skills and craftiness!!! I’m definitely making these! So sweet and nostalgic looking! Fun to have old family photos on display. Thanks for the idea!